Living at Rollins will provide you daily opportunities for fun, bonding with new friends, and successfully transitioning to your next phase of life. From the moment you arrive, you will find resident assistants and hall directors in your residential facility to provide help, answer questions, and coordinate an active calendar of floor programs, campus activities, and available resources. Our partners at Dorm Décor can transform your room! Below is a list of suggested items to bring for your room on campus. Your actual needs may differ from the list below. Be sure to contact your roommate to arrange who will be what of the larger items in the room. Did you see our showroom in Ward Hall on your campus tour? Our partners from Dorm Decor can help you transform your room with headboards, dorm cubbies, and more! Visit this Dorm Decor's site for decoration inspiration! Laundry detergent—We strongly recommend HE (high-efficiency) type liquid detergent. It is specifically formulated for the front load washers. Students are allowed to decorate their room in any way that does not permanently alter the room (i.e. using posters, rugs, plants, etc.). Students should use small nails and pins to hang items. 3M hooks and tape will damage the walls and is therefore not permitted. Students may not mount TVs. Students are not permitted to dismantle any College furniture, attach anything permanently to the walls, ceiling, or doors (including lofts, bunk beds, bookcases, wallpaper, and glued corkboards); paint walls or baseboards; trim furnishings, doors or anything metal. Double-sided foam mounting tape is prohibited due to ensuing damage to walls and doors (painter's tape is recommended). Students are not permitted to modify their room in any way that includes installing wallpaper, wallpaper borders or contact paper on walls or fixtures within the room. 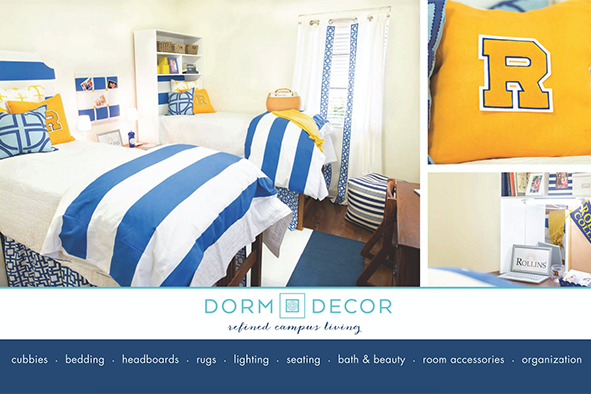 Rollins College partners with Dorm Decor for all of your on-campus decorating needs. Visit Dorm Decor's site for more information. Large string lights that produce heat are not allowed. No live or previously live greenery (Christmas trees, garland, etc.) except regular house plants are allowed in either rooms or lobbies within the halls. decorations in common areas as well as in residents' rooms must not interfere with emergency exiting at any time. Cooking Kitchen facilities for limited cooking are available in most residence halls. Lofts: Most furniture provided in the residence hall rooms is loftable; however, Residential Life staff members are not allowed to loft the furniture for you. Additionally, all furniture will need to remain in the room during the year. Lounge Spaces Lounges are furnished for students and their guests. Room Furniture Each room is furnished with a bed, desk, desk chair, dresser, wardrobe/closet, trash can and recycling bin. Students are responsible for maintaining all room furnishings in check-in condition and all furniture must remain within the room. Security All residence halls are locked 24 hours a day. Students should not prop doors or lend keys/IDs to non-students. Lost or stolen keys and IDs should be reported immediately to the Office of Residential Life. There is a fee to replace keys and IDs. Washers and Dryers For your convenience, laundry machines are provided at no additional cost. Wireless Internet Wireless internet is available in all residence halls at no additional cost. Below are links to various resources concerning our policies. Any additional questions can be addressed to the Office of Residential Life. Maintenance staff members are assigned to each residence hall and are under the direction of Facilities Services. These individuals are a vital part of the residence hall community and perform a variety of daily functions to help maintain a safe, comfortable, functional, living and learning environment for residents. To make a maintenance request, fill out an online work order. Please check the "Rates and Amenities" tab for all rate information. Can I ship belongings to the College before my arrival? There should be no other information on the label. It will be at the warehouse when you arrive to campus. What if I have a housing request based on medical, psychological or disability related needs? The Office of Residential Life & Explorations is committed to achieving access and does not discriminate against persons with disabilities. For more specific information, review the Housing Accommodation Guidelines. To insure the best possible roommate pairings, incoming students for fall semester will receive their assignments and roommate information toward the end of July. Spring Semester incoming students will typically receive information approximately a week prior to the residence halls opening for spring semester. What type of furniture does Rollins College provide? Rooms are furnished with a dresser, closet or wardrobe, bed, desk and desk chair for each assigned occupant and a trash can and recycling bin for each room. These items cannot be removed from the room. Who will clean student rooms? Before check-in, the Facilities Management housekeeping staff will clean each room. After a student moves in, each resident is responsible for keeping his or her room clean. Yes, each window has an installed horizontal blind. What is the size of a room? Does Rollins offer a moving and storage service?What is the size of the mattress? Where can residents do laundry? What is the cost? Each residence hall has a laundry room. Laundry machines have been provided at no additional cost. Who is responsible for the residence halls? The Office of Residential Life & Explorations is responsible for the overall operations of the residence hall system, including housing assignments, programming, hall opening, hall closing, etc. The Office of Residential Life & Explorations works closely with the Facilities Management to provide students with a comfortable living-learning environment. The Office of Facilities Management is responsible for the maintenance and housekeeping for our buildings. Does the College insure a resident's personal belongings? No. The College is not liable for damages to or theft/loss of personal property, for the failure or interruption of utilities or for injury to persons. Students must provide their own personal property insurance or make sure they are covered under their parent's homeowner's insurance policy. The College will not issue refunds for the failure or interruptions of utilities. For your convenience, National Student Services, Inc. is the premier student personal property insurance provider in the United States. Visit the National Student Services website or view the National Student Services brochure. Yes, the only company we endorse is Rollins Moving Services. Visit the Rollins Moving Services webpage or contact them at movingservices@rollins.edu for more information. Please check out the Residential Life calendar. Yes, following the first two weeks of each semester room changes are permitted. Residents, however, first must speak with their roommate and Resident Assistant or House Manager about their concerns. Typically the staff member can assist the residents by mediating and helping the students communicate with each other. If the problem persists or is deemed irreconcilable by staff, then the student may come to the Office of Residential Life to complete a room change form. A change will be approved only if housing vacancies warrant. What types of safety and security measures are provided in/around the residence halls? What do students do in the event of a hurricane that requires sheltering? Rollins College does not provide shelter for residential students during hurricanes. All residential students are required to complete a hurricane preparedness plan prior to moving into their residence hall. Please see the Campus Safety website for up to date information.